When ants are praised for their intelligence, its for their collective intelligence. By following biological programming or pheromone trails, ants build giant, well-ventilated structures or craft the most efficient possiblenetwork of paths to find food. They're treated as a set of pre-programmed instruments that follow instinct blindly. So it's strange to learn that ants form teacher-student relationships. More experienced ants will take newbies under their wing — at least for a short time. Scientists figured this out by being the biggest imaginable jerks to whole colonies of ants. First, they painted individual ants, giving each a series of colors to distinguish each ant — and probably to get across the message "I own you" to every single ant in the bunch. Once they were able to tell one ant from another, the scientists decided to test them by ripping their homes to shreds, and seeing how the ants coped with it. First priority was to save the queen. Next priority was to get a new house and carry most of the other ants to it. Then came the time to teach other ants the way to, and around, the new home. Ant teaching isn't particularly dramatic. One ant, which knows the trail, slowly forges ahead. Another ant follows behind. The lead ant stops every few steps, allowing the ant behind it to look around and memorize landmarks. Once the following ant gets its bearings, it taps the lead ant on the leg and the lead ant continues. It's one of the more simple forms of teaching out there, but it shows that even ants have come up with a way to deliberately share knowledge with a chosen few. 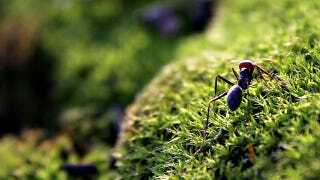 And it shows that even ants, which do so much by instinct, have the capacity to learn.